In the midst of heated battle, Ed and Prince Lin of Xing are swallowed whole by the homunculus Gluttony. Will they survive the depths of Gluttony's gullet like Jonah inside the whale, or has Al lost his brother for good? And the political power structure of the military may be irreparably shattered when Colonel Mustang confronts F?hrer President King Bradley with his horrifying suspicion that Bradley is a homunculous! http://allhailgrimlock.booklikes.com Grimlock ♥ Ultra Magnus 5.0 FMA Volume 13 - still so good! text FMA Volume 13 - still so good! This volume is full of awesome surprises! Ed and Lin are swallowed by Gluttony and as if that isn't crazy enough they actually find out some super important things. 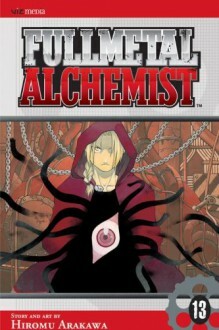 This is definitely one of my favorite Fullmetal books so far.